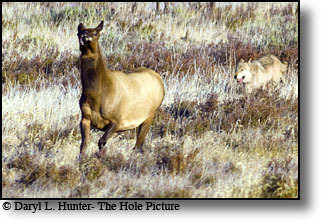 A grey Yellowstone Wolf chasing elk in hopes of a elk dinner. 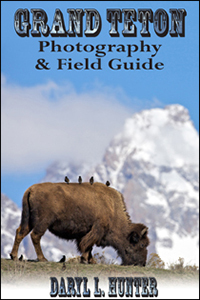 On the Wildlife Safaris and Yellowstone Tours I lead in Yellowstone what my clients hope too see more than anything else is a wolf and I must confess during the best wolf watching times of the year I drop all I am doing to spend all free time photographing wolves and grizzlies. The wolves of the Greater Yellowstone Region are members of the Canidae family, the Gray wolf (canis lupus), can grow to 4.5 to 6.5 feet in length. Adult males average about 100 pounds, but can weigh as much as 130 pounds. Females weigh slightly less. Gray wolves live up to 13 years old and can range in color from black, gray, or nearly white. A wolf pack is an extended family unit that includes a dominant male and female, called the alpha pair. In each pack, the alphas are usually the only ones to breed. Most packs produce only one litter of four to six pups per year. Pack sizes vary considerably, depending on the size of the wolf population in a particular area, whether they are feeding pups and the quantity of prey available. In the northern Rocky Mountains, packs average ten wolves, but the Druid pack in Yellowstone once had 37 members. The Druid pack later split forming several smaller packs. Wolves are sometimes mistaken for coyotes or domestic dogs, but a wolf’s large size, long legs, narrow chest, large feet, and wide, blocky head and snout distinguish it from the other canid species. Wolves hunt in packs for large animals like moose, bison, and elk; a wolf hunting alone will eat rabbits, beavers, and other small mammals. 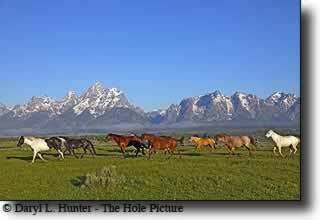 Three wolves traveling north ten miles north of Jackson Hole Wyoming in Grand Teton National Park. 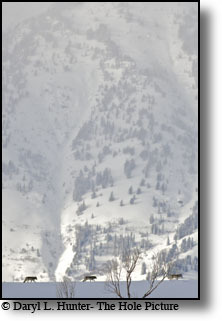 The mouth of Death Canyon of Grand Teton Range is in the background. Wolves nearly disappeared from the west by the early 1900s. In 1930, a federal agent killed the last indigenous gray wolf of Yellowstone. In 1933, the Yellowstone adopted a policy, limiting the unnecessary killing of predators in the park, but it was too late for Yellowstone’s wolf. Since then a conceptual evolution has taken place, in 1972, ideas of restoring the wolf to the Yellowstone eco-system, to restore endemic biodiversity, began to circulate. A new philosophy of wildlife management took root when the Endangered Species Act was passed in 1973, Consequently, wolves were listed as an endangered species in the United States. 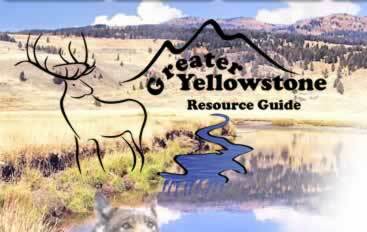 As part of a recovery plan the Fish and Wildlife Service, recommended introducing an experimental population of wolves into Yellowstone National Park. The plan included special regulations that took effect in November 1994, outlining how wolves would be managed as a nonessential experimental population under section ten of the Endangered Species Act. After much litigation and compromise, in 1995, scientists began introducing wolves from Canada into Yellowstone National Park. Forty-one wolves were released in Yellowstone from 1995 to 1997. The goal of the officially adopted, and universally agreed upon (compromised), recovery plan was to reintroduce 30 wolves to Yellowstone and Idaho each year for the next three to five years, or until ten wolf packs were established and stable. A pack typically includes the alpha pair, the young wolves born that year, perhaps last year’s young, and sometimes a few older wolves that may or may not be related to the alpha pair. Once the population has stabilized at this pre-designated, and agreed upon, level, the wolf would be down-listed from “endangered” to the “threatened” category. In the compromise plan the possibility that once these minimum desirable population goals are achieved, regulated hunting of wolves would be permitted to control the population from becoming too large. 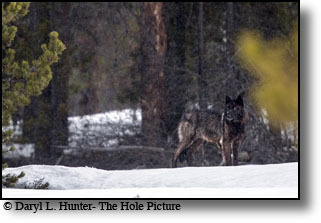 Since reintroduction the wolf population of the Greater Yellowstone Ecosystem is thriving. In the ensuing years the wolf population grew to 650 wolves by 2002 and more than 1,500 today (January, 2008). The wolves are growing at a rate of about 24 percent per year, according to federal counts. This prolific animal population has grown exponentially beyond the wildest dreams of environmentalists and fulfilled the nightmares of the regions hunters, and ranchers. A black wolf of Yellowstone's Druid Pack alternates his time between chasing off ravens and dining on his Trophy Bull Elk in the Lamar Valley. Populations of wolves have been increasing in the states around the Yellowstone are and beyond, Washington, Oregon and California all have wolves today, and their fate continues to be debated among researchers, ranchers, environmentalists, and other public citizens. Hunting and other measures will keep the population between 880 and 1,250 after delisting, according to Ed Bangs, wolf recovery coordinator for the U.S. Fish and Wildlife Service. Environmentalists argue 2,000 or more gray wolves are needed before protection should end. A proposal from Ed Bangs, and the Fish and Wildlife Service would allow ranchers and trappers to obtain permits to kill wolves so that livestock depredation from wolf over population, will stay minimal. Protection would resume if wolf populations decreased to fewer than 450 wolves in the region; if the number goes down to 300 the species would be reinstated to the protected list. Research is revealing that wolf reintroduction is slowly changing the balance of the Yellowstone ecosystem: elk no longer casually wander in the open, and the dominance of the coyote has been reduced. Other studies find wolves may also be restoring Yellowstone's natural equilibrium, streamside cottonwood and willow are growing vigorously again in areas overgrazed for much of the last century, aspen trees are surviving winter elk browsing for the first time in decades. Another study shows that a process called "the ecology of fear" is at work, a balance has been restored to an important natural ecosystem, and. Unlike other top predators, Yellowstone's wolves, much to the chagrin of hunters, wolves routinely leave unfinished elk and moose carcasses. These leftovers provide scraps for scavenging coyotes eagles, and other animals. A feast of science has been unleashed about wolf population dynamics and how these divisive predators reshape an ecosystem. The wolf controversy among environmentalists, ranchers, and other stakeholders remain the same: is there a plan that is both economically and ecologically beneficial, and how is it to be achieved? Wolves also play an increasingly important role in the Northern Rocky Mountain region's economy. According to a recent study, the roughly 151,000 people who visit Yellowstone National Park each year to see wolves generating $35 million annually to Montana, Idaho, and Wyoming (2008). Nearly four percent of Yellowstone National Park's 4.2 million annual visitors (2016) say they would not have visited the nation's oldest national park if wolves weren't there. 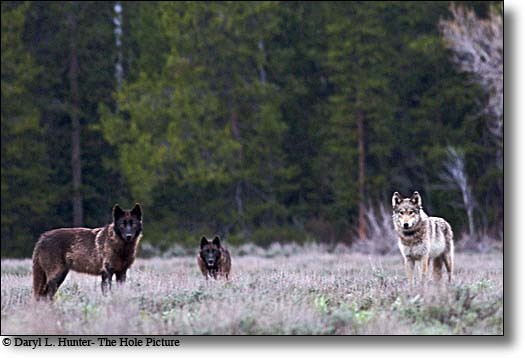 Wolves operate in an open landscape as a social group and team, this facilitates observation of interaction between individual wolves, packs and their prey. They often hunt in the open, where people can watch them. The key to differentiate them form coyotes is individual wolves may be white, black, brown, or grey and wolves are much larger and coyotes are always grey. The wolf controversy among environmentalists, ranchers, and other stakeholders remain the same: is there a plan that is both economically and ecologically beneficial, and how is it to be achieved? The jury is still seated on this question. The wolves have begun howling in Yellowstone again. Two, three, four at a time, all at different pitches, Wolves howl for a variety of reasons. Pack members will chorus howl to defend their territory and rally the pack together. Most howls heard in the pack are chorus howls. They may be a response to the howling of a neighboring pack of wolves or a coyote. Wolves will even howl to something that even sounds similar to a train whistle, fire or police car siren or even a human. Such howls, though social in nature, also serve to defend the pack's territory against other wolves. Wolves can recognize the voices of others. The responses of a pack mate, of a neighboring wolf pack or a complete stranger, all solicit different responses. Contrary to popular belief, wolves do not howl at the full moon any more often than at any other time of month. They also do not howl only at night. 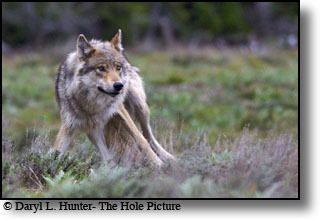 They do howl more frequently during the hours around sunrise and sunset, for they are more active then. Wolves also howl more often in the winter months than in the summer, however, they can be heard howling any time of day any time of the year. Yellowstone wolves are howling, chagrinned ranchers and hunters are howling with anger, tourists and environmentalists are howling with delight, wolf entrepreneurs, delightedly are howling all the way to the bank. Regardless of your position at this contentious table, all are excited when they see this remarkable creature in the wild. There are numerous companies happy to facilitate the aspiring wolf observer on a guided trip, but as a safari leader myself you must realize that, like fishing, some days you are going to get skunked. You greatly increase your chances of seeing wolves if you are in wolf territory before the sun comes up, as this is prime hunting time. 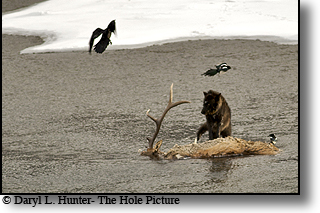 Yellowstone Food Fight - film by Daryl L. Hunter • A grizzly takes a kill from wolves but the wolves are reluctant to give it up. It is a sunny winter afternoon, and Simond Raymond has a problem. His flight home to Yverdon-les-Bains in Switzerland leaves this evening from Bozeman, Mont. But at the moment, Raymond is standing in the snow of the Lamar Valley of Yellowstone National Park, 120 miles away. He must get his rental car over 30 miles of twisty mountain road, much of it snowpacked and icy, before even reaching the main highway, then another 90 miles, including a mountain pass, to the airport.